This spring, home decor is all about the natural elements. From stone or metal accessories, to deep blues and soft pinks, to floral scents both indoors and out, each of these inspired ideas will fill your home with reminders of the best parts of the season. White farmhouse style sinks, bright white cabinets, white subway tile, and white quartz marble countertops top choices for a bright and airy kitchen. You can refresh wood cabinets with just a simple coat of paint, or update a backsplash with white subway tiles (yeah, they’re still in! ), to give your kitchen a makeover at a nominal price. Those who prefer softer colors during the spring will love the amount of blush accents that are popping up at home decor stores this season. Pastelss are thing of the past – and probably the future again someday, because everything comes back around – but for now, blush rules with rosé-colored flowers, glassware, cake plates, vases and other accent pieces, and even throw pillows and blankets. This hue can brighten up nearly any room, adding a soft feminine touch. Bring springtime beauty right up to your entrance with welcoming blooming florals and natural accents — such a welcoming site to come home to, especially while the trees and tulips aren’t quite budding yet. And if you haven’t tried making your own wreath yet, I highly recommend it! It’s actually pretty relaxing and really rewarding to see one come together. 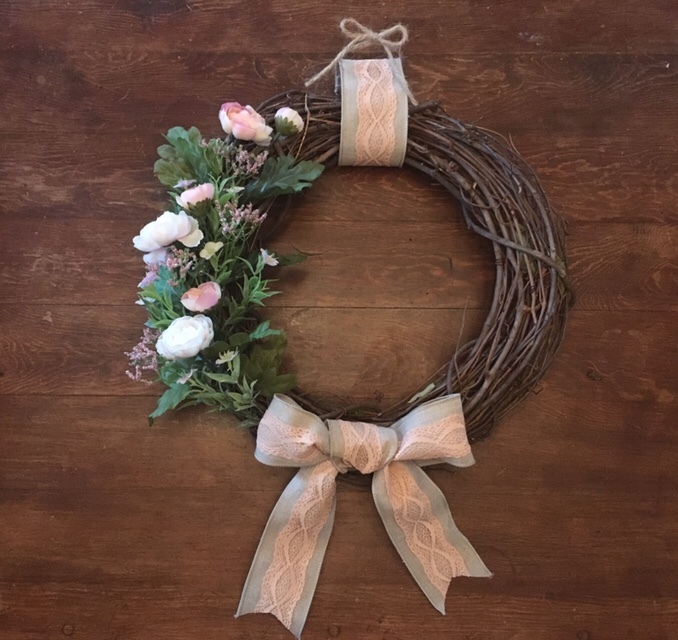 If you haven’t seen it yet, check out the blush floral wreath I’m offering on my Etsy page! Over time we’ve seen the increasing popularity of using gemstones, river rocks, and semi-precious stones in a variety of home decor, from coasters to bookends. But, this season those bright jewel tones are taking over. Large scale prints of beautiful crystals, agate bookends, stone accented lamps, and kitchen accessories ranging from quartz countertops to cheese plates. Large crystals such as rose quartz or deep blue hues make a stunning statement piece or hutches and tables and other centerpiece. True indigo is a natural dye, but whether true or “inspired by”, this rich, blue hue is ev.ry.where. this season! You’ll notice it on the covers of home magazines, as a stunning accent wall paint, as a striking furniture piece (sure to initiate conversation from guests), and more. In small doses, the color truly stands out — and it even pairs well with blush. Previous Post New Spring Decor in the W+W Etsy Shop!